Postal workers at a previous protest at Staples. They will protest again on Thursday against mini post offices at some 50 Staples in 27 states. 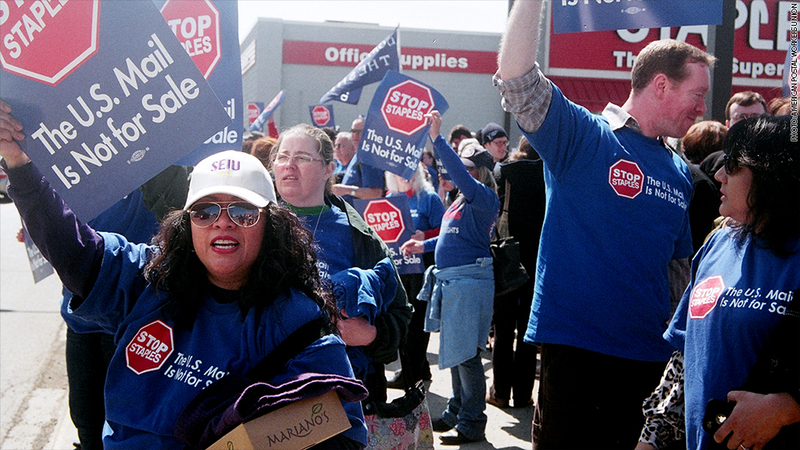 Staples shoppers could face a postal workers' picket line on Thursday. The American Postal Workers Union has organized protests at 50 of the office supplies stores in 27 states to oppose a deal where U.S. postal products and services are sold at Staples. It's not the first postal worker protest against the Staples (SPLS) mini post offices, but it will be the largest so far this year, according to the union. Members of other postal unions are also expected to join the protests. Since November, 82 Staples stores have been selling traditional mail services as part of a short-term "pilot project" scheduled through September. According to the union, the postal service plans to expand the pilot project to 1,500 stores nationwide. The unions' beef is that the mini post offices are operated by lower-wage Staples staff instead of U.S. Postal Service employees. They claim the move is a step toward privatization of the Postal Service, which will shutter standalone post offices and wipe out decent paying jobs. "The protest is very important because the Staples deal is a direct attack on not just our members, but the American public," said Jonathan Smith, president of the the local New York City chapter of the union. "This isn't just about postal jobs," said Mark Dimondstein, president of the American Postal Workers Union, which represents 220,000 current and retired mail workers. "Many people are outraged that a tremendous public asset is being turned over to a struggling private company." 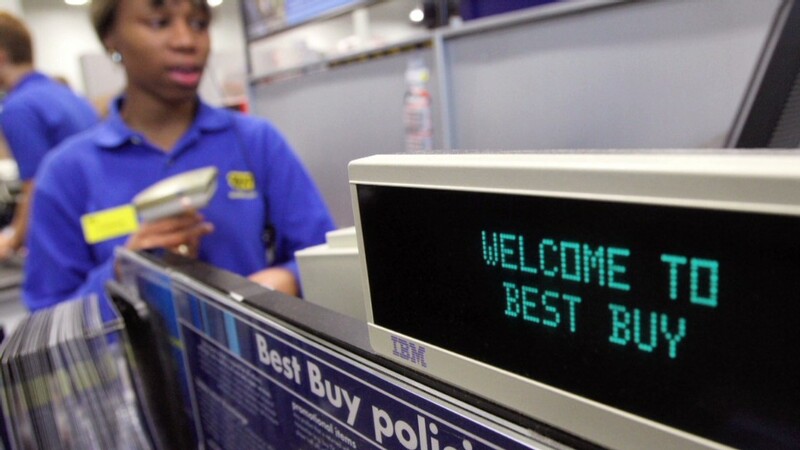 In the meantime, Staples announced last month that it is closing 225 stores by 2015 as it struggles with lower sales. Staples didn't return a request for comment, but a spokesman for the company has told CNNMoney that the pilot program offers "added convenience for our customers." The U.S. Postal Service denies that the mini post offices at Staples aims to replace bricks and mortar post offices. The agency says it's just one of several moves to "grow the business." The retail partners has "never been an earmark to pave a way to privatization," said spokeswoman Darleen Reid-DeMeo. The agency lost $5 billion in the last fiscal year ending Sept. 30, 2013, the latest in several years of losses. The independent, self-financed agency has exhausted a $15 billion loan from taxpayers to make up for shortfalls. Much of its cash problems stem from a congressional mandate to make annual $5 billion payments for future retiree health care benefits. But declining mail volume has also played a key role. Last year, 2 billion fewer pieces of mail were sent out compared with 2012.